Just hours after the government of Bashar al-Assad launched its most murderous assault to date, massacring more than 200 men, women, and children in the city of Homs, the peace plan backed by the Arab League met its ignominious end in the U.N. Security Council. This was an abject diplomatic failure. The lesson to be drawn, however, is not that diplomacy is hopeless. Indeed, if many more thousands—and possibly tens of thousands—of Syrian deaths are to be avoided, the solution we seek needs to be a political agreement, not a military campaign. Military intervention on the model of Libya is simply not feasible—logistically it would be far too difficult, and politically it could backfire, generating massive civilian casualties and unifying key sectors of Syrian society behind the very regime that needs to be ousted. That’s not to say that Washington’s leadership isn’t needed. Quite the opposite. Any effective solution will be the product of skillful and high-stakes diplomacy that’s highly attuned to the political dynamics both in Syria and on the international stage—and the United States can and should play a leading role in forging it. It’s clear that any refashioned diplomatic effort must find a way to usher Assad and other key Baath Party regime stalwarts from power. 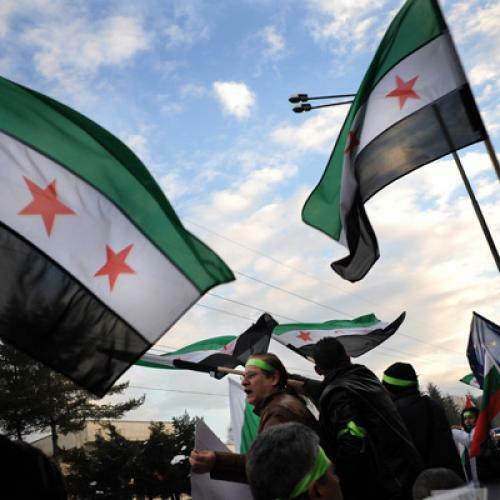 Syria cannot achieve peace without moving toward a more just and representative government. At the same time, it can not neglect providing a credible guarantee for the collective security of the Alawite minority (about 12 percent of Syria’s population) that has controlled the state and the army since Hafez al-Assad seized power in a 1970 coup. And it must ultimately provide a safe exit and exile for key regime leaders, beginning with President Assad himself. That means that the United States, together with the U.N., the European Union, the Arab League, and Turkey, will need to engage directly with Syria’s rulers in intensive diplomacy. Of course, this should be backed up by intensified targeted sanctions. But the goal should be to induce the Assad regime to accept a negotiated exit and transition, as is unfolding in Yemen, or to fracture the regime over time and peel away its pillars of support. By then, a growing number of regime elites would face the prospect of being trapped in a bleeding and decimated country, with a noose of international financial and judicial pressure around each of them personally, and dwindling prospects for exile if things fall apart. Faced with this choice, there may still be only a modest prospect that the top elements of the regime would opt to negotiate. But others just below them might well see the writing on the wall and leave, or push Assad aside and seek to make a deal. At the same time, it is important for the international community to recognize that the element of collective fear and insecurity currently felt among the Alawite ruling minority would magnify exponentially if the Assad regime continues to buckle. Some leaders may go into exile, but what will be the fate of the more than two million Alawites who remain in Syria after a deal is reached and a transition of power begins? They have no doubt looked over the border at the harsh fate of the Sunni minority in Iraq and shuddered with fear at the prospect of their own Sunni majority (about three-quarters of Syria’s population) turning the tables on them. In that way, as soon as the regime has been adequately weakened, international mediators should broadly and intensively consult among Syrians inside and outside the country, with a view to seeking protections for Syrian minorities. This should involve: an immediate and internationally monitored halt to the violence by all sides (including the resistance of the Free Syrian Army); an immediate transition to a broad-based interim government (as in the Arab League plan); and agreement on a set of core constitutional principles, recognized as legitimate by both Syrians and the international community, that would ensure the security of the Alawites and other minority groups. Then a process of political transition could unfold that would eventually lead to a free election for a new representative government, with guarantees for the interests and autonomy of Syrian minorities. International mediation to end the violence in Syria would be complex and challenging. It would require the designation by the U.N. of an experienced and indefatigable international diplomat (ideally Arab), like the U.N. special envoy to Yemen, Jamal Benomar. If we want the mission to succeed, the mediator would have to be able to work not just with the Syrian opposition and the Arab League but also with the Russians, who believe that they have vital interests in Syria. If muscular diplomacy fails, we may have no choice but to help arm and train the Syrian rebels. But that would be to resign ourselves to a ghastly civil war. Yes, negotiating with people who are responsible for crimes against humanity will be morally distasteful. But the alternative is to stand aside and content ourselves with the prospect of a decisive military intervention that will not come. That would be the greater moral and political disaster. Larry Diamond is a senior fellow at the Hoover Institution and the Freeman Spogli Institute for International Studies at Stanford University.